Today’s business world is one of disruption. New technologies are rapidly changing how companies operate, and for many of today's grads, that means their future jobs may not yet even exist. One question that b-schools everywhere are scratching their heads over is how best to prepare leaders to thrive in a business landscape that's shifting so quickly. Today's solutions may not be enough to solve tomorrow's business problems, so how do you prepare students to problem solve? Innovation will be key to coping with these rapid changes. And innovating is exactly what Hult International Business School has done with its newest curriculum. 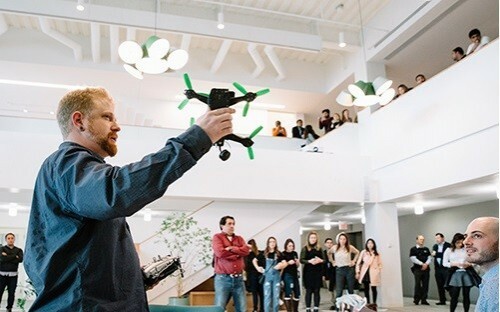 Starting this spring, the school is offering students a variety of 'nano courses' teaching students about the disruptive technologies most dramatically shaping the landscape of business. Open to all Hult students as elective options, these self-led, online courses cover a wide array of cutting-edge tech topics including drones, 3D printing, blockchain, robotics, genome editing, virtual and augmented reality, the Internet of Things (IoT), artificial intelligence and machine learning. They're called 'nano' because they're shorter than Hult's regular electives, meaning a student can take three nano courses in place of one regular elective. “Technology is transforming human interaction, business processes, and whole industries globally," says Robert Anthony, Professor of Management at Hult. "Hult reviews its curriculum constantly to make sure it's relevant. More than ever, it's clear that technology is changing the ways that we communicate, shop, and experience each other and the world, and we want what students learn to reflect that. “Typically, technology is taken up in broad terms in innovation or advanced strategy electives, but the nitty gritty of specific, game-changing technologies and their impact are seldom addressed in detail. Through encouraging students to think about the business landscape of tomorrow, Hult hopes to make its graduates the most relevant and competitive on the job market. “Our “nano courses” are practical and in keeping with the mission of our school” says Robert Anthony, professor of Management at Hult. “Hult students get a hands-on experience of globalization every day in the classroom. Most are doing a degree program in a second language; all push their personal boundaries continuously," he says.